I think it may happen more often than some growers would like to admit, but it probably isn't uncommon to have pumpkin dreams this time of year. I can only remember having them a couple of times, but last night I had a pumpkin dream. I dreamed that it was going to frost and so I was scrambling to get some stuff sprayed on the leaves to try to protect the plant. Don't remember all of the details, but it was somewhat stressful. 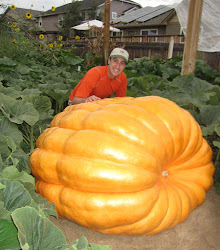 I remember I had a pumpkin dream when on a business trip shortly before my first giant pumpkin weigh-off. I dreamed the pumpkin had gone to mush. I'm wondering if anyone ever has a nice pumpkin dream? This morning gave both plants some compost tea that was brewed for 24 hours. Put in a little extra seaweed in the brew this time along with Actinovate. I remember seeing a little experiment once where they cut a leaf off the vine and put some seaweed on one part of the leaf and didn't do anything with the rest of the leaf. Even though the leaf was cut off the plant the leaf with seaweed stayed green longer. My leaves on the 747 plant have looked tired for a long time so I'm hoping the seaweed will help keep them going a bit little longer. The vines on that plant continue to grew fairly quickly so it has a number of newer leaves. The 1685 plant has started to look tired these last few days, but overall is in much better shape. Vine growth is slow however. It has another month until its pumpkin will be cut from the vine, but it is in good enough shape it should be okay.